Hey all and happy Workwear Wednesday! Thought I would switch it up a bit this week and rock some pants! I saw these at Target and figured I should give them shot, since they looked so comfy. 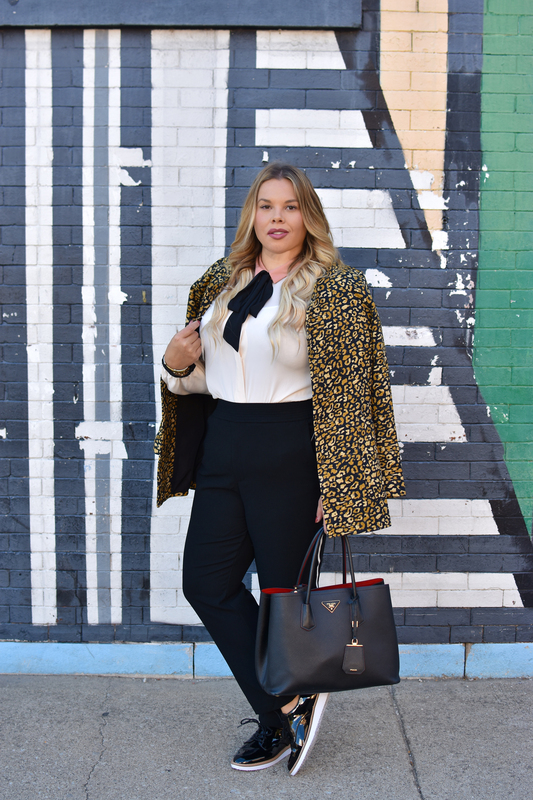 This whole look is actually from Target… I love finding all the pieces in one place! The shirt was actually what first caught my eye. I loved the pink collar with the black bowtie, I thought it was a nice contrast. Instead of tucking it into a skirt, I wanted to try these pants and see how it worked together! I ended up loving the pairing and the pants are seriously sooo comfy! I love the way they feel on and I love that they have pockets. I tend to like to wear my pants higher (it’s a comfort thing) so I was super happy to find out the waistband was elastic, making them look a bit better (and fit better) anywhere on the hips or waist. I paired this whole look with this patent pair of shoes (also comes in silver!) and I loved the price…. $27! I had seen similar pairs recently and almost pulled the trigger on another pair somewhere else, but thankfully I held off. 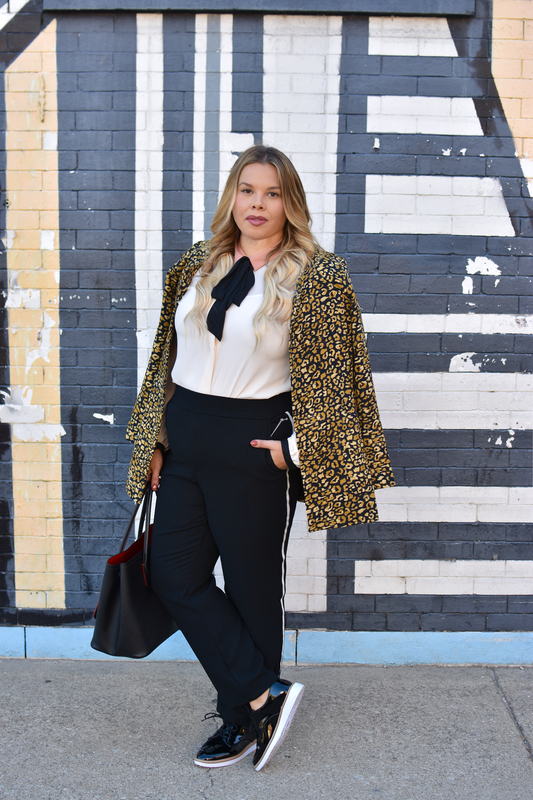 I wanted to incorporate a bit of fun with the shoes and this leopard coat. I thought the leopard coat would add a little something to this all black and white look. 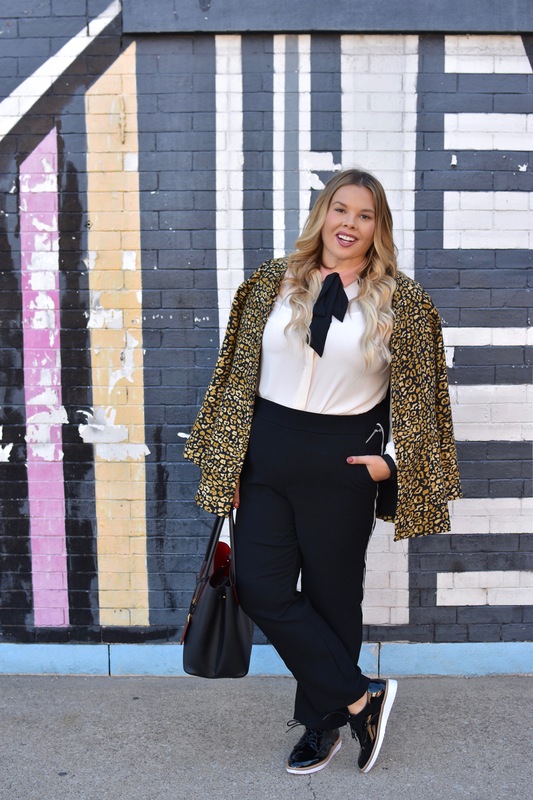 I really love leopard as a neutral, so I am down for leopard in any outfit! Also, this look is not sponsored in any way… I just happened to really like their new fall collection! It also makes me so happy that everything is available in plus and straight sizes for literally every piece in their collection! I am linking both just in case! I love the leopard print but the shoes are my fav part of the look! SO cute!